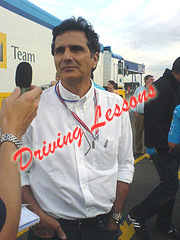 Nelson Piquet Sr. went back to Driving School, taking his first driving lesson earlier this week in Brazil. He needed to take driving lessons again as he had lost his driving license for getting too many speeding and parking tickets. Piquet Sr, the three time Formula One World Champion has to take courses again to get back his driving license. “I think we have to pay for our mistakes, It’s not even just a speeding problem. I got tickets for all kinds of reasons, for things like parking where I shouldn’t.” said Piquet.